Those are probably familiar words for most of us. I don’t just mean in the context of today’s gospel (John 1:29-42, the Second Sunday after Epiphany, Year A). Even if you’ve never read or heard today’s gospel you’ve probably both heard and spoken those words. How many times have you heard your child or grandchild say, “Come and see?” “Come and see my drawing!” “Come and see this bug!” “Come and see what I made!” There was excitement and joy in their voice, maybe even a sense of urgency. Their words were an invitation to share in their discovery, to experience their world, and to participate in their life. It was the invitation to let your life and theirs come together as one. That’s why you can’t just sit back and say, “No, just tell me about it.” That’s not an acceptable answer. They know that information and relationship are not interchangeable. They are not the same thing. “No, I’m not going to tell you,” they will say. “You have to come and see.” In those moments there is only one thing to do; get up and go look. If you haven’t heard a child say, “Come and see,” maybe you remember saying it when you were a child. Something happened and you just couldn’t keep it to yourself. “Come and see,” you yelled. You wanted that other person to enter into and be a part of our life. It’s not just kids that say that. Adults say it too. We invite our spouse, a best friend, a trusted colleague to come and see our work and accomplishments, to come and see our pain and struggles, to come and see our life. Not only that but we also want to be invited to come and see theirs. At some level these are moments of epiphany, moments when God reveals his life in us and among us. That invitation is the antidote to the ways in which we often live vicarious lives. Too often we allow political agendas, talk radio, surveys, and news to tell us what to think rather than to help us engage our world. We settle for church leaders telling us what to believe rather than pointing us to and opening the doors to the mystery of Jesus’ presence in our lives. We idolize what others have, what they do, and who they are rather than discovering the unique ways in which God reveals himself in and through our own lives. We are living secondhand lives and dying from a secondhand faith. A secondhand faith can neither sustain nor transform life. That happens only by firsthand experience. Think about it for just a minute. Would you rather be told how pretty the sunset was or be drenched in the pinks, oranges, and purples of the evening sky? Would you rather hear a love story or fall in love and live a love story? Would you rather read a travel brochure or travel to a new land? Would you rather know about Christ or know him? That’s the difference between a secondhand faith and a firsthand experience. Our relationship with Christ, with one another, and with ourselves cannot be based on a secondhand faith. It must be a firsthand experience. A firsthand experience won’t let us stay where we are. It moves us to a new place. It opens our eyes to a new reality. It turns our life in a different direction. It gives, grows, and sustains life in a way secondhand faith never will. The deepest and most profound firsthand experience is Jesus himself. In each of our lives he comes toward us. His coming is always a moment of decision. We must choose whether we will be spectators of or participants in his life. That was the choice John the Baptist set before his disciples. John “was standing with two of his disciples, and as he watched Jesus walk by, he exclaimed, ‘Look, here is the Lamb of God!’” It was their moment of decision. Would they stay or would they go? Would they settle for a secondhand faith, information and facts about Jesus, or would they choose a firsthand experience of his life? If they choose a firsthand experience they will have to leave John behind. They will have to let go of that which is familiar, comfortable, and known. The will have to open themselves to something new and something different. You can probably remember times like that. It can be difficult to let go of a secondhand faith and life. It usually means there will be more questions than answers. What are you looking for? Where are you staying? Those are not so much questions to be answered as they are experiences waiting and wanting to be lived. A firsthand experience invites us to discover the answers by living the questions. Think how different today’s gospel would be if Jesus had just answered their question. “Where are you staying?” “Oh, it’s just a couple miles down this road. Second house on the left.” What do we do with that? How does that change anything? What difference does it make if we know Jesus’ address but we are not invited in. We might as well stay where we are. But that’s not how Jesus responds. Jesus offers more than his address. “Come and see,” he says. There is reassurance and promise in his words. That means that he has something for us. It means that he is opening himself to us and inviting us in. He has gone ahead of us and prepared a place for us. Regardless of what’s going on in our life he makes it safe to move forward and take the next step in confidence that his life and presence await us. “Come and see” is his invitation to find ourselves and discover our lives. Last week I went to visit a friend, an elderly priest who has been and continues to be my teacher. He sat in a recliner with his legs raised. His room is institutional; a twin bed, a desk, bare walls, a television. For the last few months he has lived in this nursing/retirement home with multiple fractures of his hip and leg. Before that he lived the last forty years alone in the silence and solitude of the South Texas desert, immersed in a life of prayer. That was his home, his vocation, his life. That place gave meaning to who he was and what he did. Forty years is a long time. I wonder what Jesus wants to show you? In what ways does he want to share his life with you? How might he be offering himself to you, asking you to participate in his life? Look at your life. What do you see? What is it like? Is it full and abundant? “Come and see.” Empty and desolate? “Come and see.” Filled with change, chaos, or the unknown? “Come and see.” Is it one of joy and celebration? “Come and see.” One of loss and sorrow? “Come and see.” Do you feel lost and confused? “Come and see.” Is it smooth sailing? “Come and see.” Is it weighed down by guilt, shame, despair? 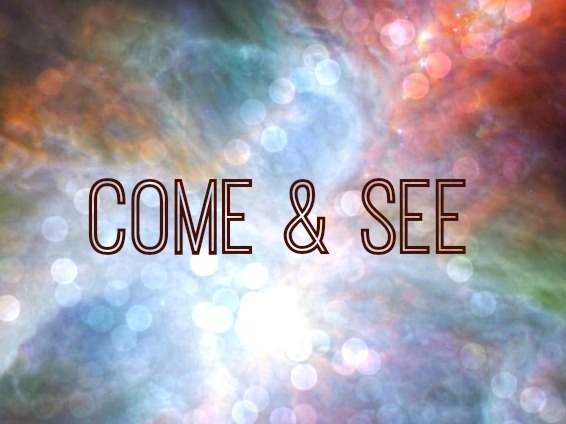 “Come and see.” However you might describe your life Jesus’ response is always the same. Every life and every situation echoes with Christ’s invitation, “Come and see.” He is there offering himself as the firsthand experience of your truest self your truest life. Don’t just take my word for it. Don’t believe it just because I said it. Get up and go look for yourself. The whole post has moved me beyond words. Thank you Julien. I am glad the post was meaningful. I am not what you may call a “religious” person. But the message of this poignant post cannot be misunderstood by anyone prepared to hear and see. Thank you! Truly evocative Homily for 21st.century …..in the footsteps of Jesus and Pope Francis! Barry, I am grateful for your gracious and very generous words. He has given me a lot to think about recently and over the years. First rate post! Thank you.